LONDON - Unilever has initiated legal action against the British National Party (BNP) after the far-right party featured a jar of Marmite on its latest political broadcast. 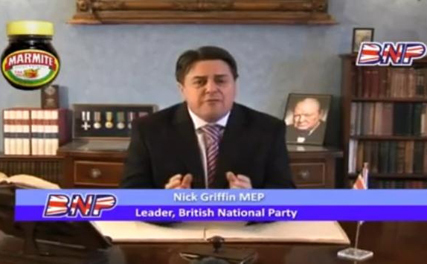 On the YouTube video, BNP leader Nick Griffin is seen speaking to the camera with a jar of Marmite floating in the top left of the screen. Griffin claims this is revenge for the brand's latest election-themed advertising campaign. In the Marmite campaign, by DDB London, two TV ads featured fictional political parties named the Love Party and the Hate Party, each either praising or attacking Marmite in a continuation of the brand's ongoing 'Love it or hate it' positioning. Griffin stated on his Facebook page: "Unilever PR men and lawyers over us like a rash. Very upset at our using Marmite in our TV broadcast. They should have thought of that before modelling the one for their Hate Party on us. "They'll be even more upset if they push us further and I start eating a jar of Marmite on my next live TV appearance!" In an official statement, a Unilever spokesman confirmed the company has "initiated injunction proceedings" against the BNP to have the Marmite jar removed from the online broadcast and prevent the party from featuring Marmite again in the future. "It has been brought to our attention that the BNP have included a Marmite jar in a political broadcast, showing currently online, and we want to make it absolutely clear that Marmite did not give the BNP permission to use a pack shot of the product in their broadcast," said the spokesman. He added: "Neither Marmite nor any other Unilever brand are aligned to any political party."